During The Hades Arc: Sanctuary of Saint Seiya, Aquarius Camus along with the 6 other Gold Saints who died earlier in the series are resurrected by Hades to lead an assault on Athena's Sanctuary and take her head. 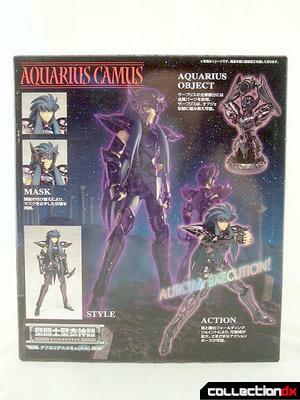 As the Hades saga unfolds Camus along with Capricorn Shura and Gemini Saga fights against Virgo Shaka. During the battle Virgo strips the resurrected Saints of their 5 senses leaving them deaf, blind and unable to speak. 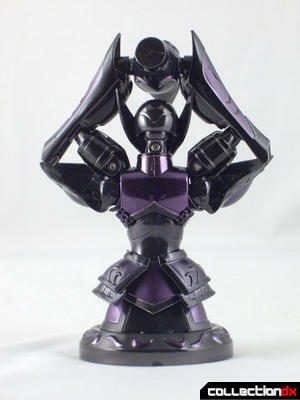 They end Shaka's life by performing the forbidden technique, Athena's Exclamation. A sin they repeat once again in the heart of Sanctuary against Aries Mu, Leo Aiolia and Scorpio Milo. The package is the usual cardboard shadowbox that opens very much like a book. Even going so far as to decorate the spines like they where ancient manuscripts. Generally you will always save the boxes for these figures as you need somewhere to store the extra parts and pieces and storing the spine oput makes it easy to locate a part or piece when you want it. 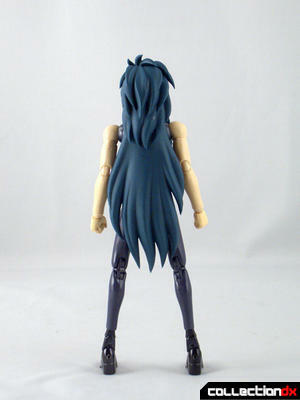 Inside, clear plastic trays present the figure and all the parts and pieces neatly and sensibly. While the figure looks spindly without the armor, that is OK as most collectors are looking to add the metal armor to the figure anyway. 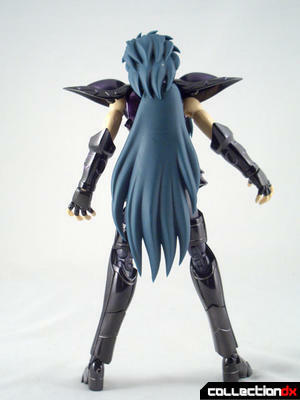 Being a bit thiner allows these figures to look “right” when the armor is attached to the figure. In Object mode the Cloth looks very nice. 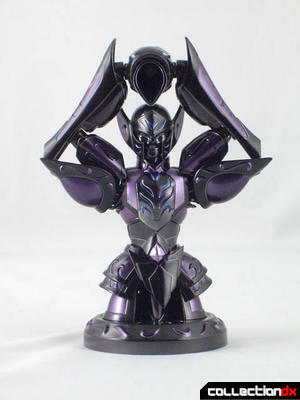 Basically you put the armor plates onto a “dummy statue” to make the object mode. I will not be using this mode for my display but it's always nice Bandai makes sure you can do this even if you do not actually see a Cloth in this state in the actual series or manga. I'll be displaying mine doing the Athena's Exclamation! 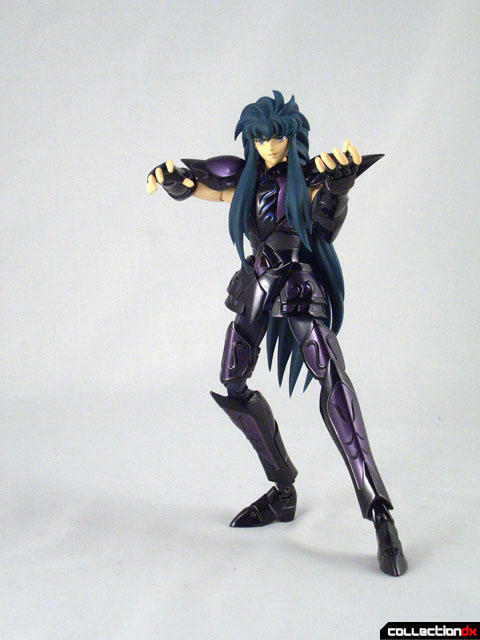 Bandai has added slightly more complicated hinging on the shoulders and hip armors for this series of Surplices allowing the figures to be posed in a wider range of motion while keeping the armor looking natural. Paint detail is very good on my sample of Aquarius (I noticed some air bubbles on the previously reviewed Gemini after the fact...) and the metal content on this release is very high. If your a fan you don't need me to tell you to get it. Now I just need to get my hands on a Scorpio Milo and I will be able to display that classic confrontation on my self and most fans would want to too; as for non SCM collectors, well if you like the design and dig metal armor the series is worth a look. Just find a design you like and give it a try. 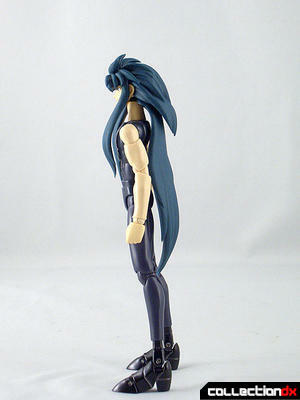 Just know this really is a series of figures meant to be posed and displayed. There not really toys for kids as keeping track of the parts would/could be a nightmare. But I can tell you this. Every time someone looks at the collection that is my mish-mash of stuff. 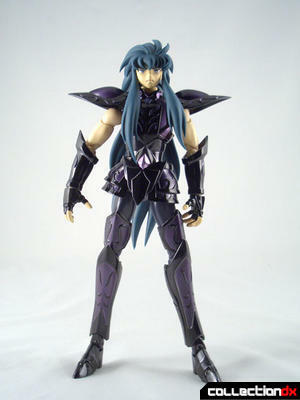 People's eyes always light up with curiosity when they see the Saint Cloth Myth shelves. They truly stand out in a collection. 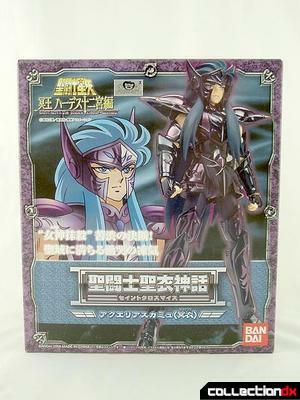 HD video embedded below and I have also update the the reviews of Gemini Saga (Surplice Version) and Capricorn Shura (Surplice Version) with HD videos as well. Hey there, nice review. I like the way you've posed the 3 samurais in your video. Have you thought about the idea of animating them in stop motion I wonder? Yes, I understand where you're coming from in terms of stop motion labor. It's time consuming I know, but once you roll the project's rough cut after production's end; the reward can be amazingly magical.